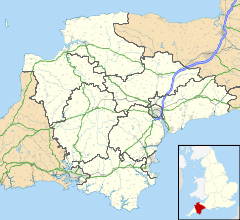 Bovey Tracey (/ˌbʌvi ˈtreɪsi/) is a small town and civil parish in Devon, England, on the edge of Dartmoor, its proximity to which gives rise to the "slogan" used on the town's boundary signs, "The Gateway to the Moor". It is often known locally as "Bovey". It is about 10 miles south-west of Exeter and lies on the A382 road, about halfway between Newton Abbot and Moretonhampstead. The village is at the centre of the electoral ward of Bovey. At the 2011 census the population of this ward was 7,721. During the English Civil War on 9 January 1646, Oliver Cromwell and a contingent of his Roundhead army entered Bovey Tracey after dark and caught part of Lord Wentworth's Regiment by surprise, catching a number of officers playing cards in an inn. Many of Wentworth's Royalist troops escaped, but Cromwell did capture about 400 horse. If local legend is to be believed, the Royalists escaped by throwing coins from the windows in order to distract the poorly paid Roundhead troops. The next day a battle was fought on nearby Bovey Heath ending in victory for Cromwell's army. The name of Cromwell lives on in the town today in both the public house "The Cromwell Arms" and the remains of a nearby stone arch, known locally (and incorrectly) as "Cromwell's Arch". The arch is actually what is left of a priory that stood previously on the site of the nearby Baptist Church. The Bovey Tracey Potteries operated from the 1750s for about 200 years. Bogey Tracey was twinned with Le Molay-Littry in Normandy, however in February 2018 local Councillors surprisingly discovered that the French town had unexpectedly twinned with another location, Theydon Bois in Essex. Since 1990, the highest recorded temperature was 27°C (81°F) in July 2018 and the lowest was -5°C (23°F) in February 1991 and March 2018. The town has over a hundred listed buildings. The parish church, at the top of the town, is grade I listed. It has a tower dating from the 14th century, many 15th-century carvings including three misericords, and a screen described by Arthur Mee as "one of the finest in this county of fine screens". The church has an unbroken list of vicars from 1258. On Hind Street, the East Dartmoor Baptist Church was built in 1824 and is now grade II listed. Original support for the church came mainly from workers in the Bovey Potteries. Since 1986, the Devon Guild of Craftsmen contemporary crafts gallery has occupied a building known as Riverside Mill, on the bank of the River Bovey. The building, dating from 1854, has an undershot waterwheel that was used to pump water up to a tank in its tower. The stored water was used as the supply for a nearby house owned by John Divett and to water its stable yard and gardens. Nearby, the Bovey Tracey Heritage Centre in the old Bovey railway station is run by volunteers and is open in the summer months. On the outskirts of the town are the House of Marbles, a visitor attraction on the site of the historic pottery; and the headquarters of the Dartmoor National Park Authority at Parke, a large house which is leased to the authority by the National Trust. Also nearby are a Devon Wildlife Trust nature reserve at Bovey Heath and the Haytor Granite Tramway, the route of which runs through the parish, west of the town. According to the town council the town has a "good mixture of shops" and there is a farmers' market on alternate Saturday mornings. Indio, long a seat of the Southcott family, later of Bentinck. The Indeo Pottery was established here between about 1766 and 1785. Parke, seat of Nicholas Eveleigh (d.1620) whose monument with effigy survives in Bovey Tracey Church. His widow married Elize Hele, whose monument and effigy faces that of Eveleigh. There are several inscribed tablets to later owners in Bovey Tracey Church. Now the headquarters of the Dartmoor National Park Authority. The town has a Non-League football club Bovey Tracey A.F.C. who play at The Western Counties Roofing Ground in the South West Peninsula League. ^ "Bovey ward population 2011". Retrieved 18 February 2015. ^ Watts, Victor (2010). The Cambridge Dictionary of English Place-names (1st paperback ed.). Cambridge University Press. p. 74. ISBN 978-0-521-16855-7. ^ Hoskins, W. G. (1972). A New Survey of England: Devon (New ed.). London: Collins. pp. 340–1. ISBN 0-7153-5577-5. ^ Andriette, Eugene A (1971). Devon and Exeter in the Civil War. Newton Abbot: David & Charles. p. 159. ISBN 0-7153-5256-3. ^ "Bovey Tracey Given "Le Grand Brush Off" by ex-twin town, Le Moggy Litter Tray". ^ "Bovey Tracey Climate Period: 1981–2010". Met Office. Retrieved 11 November 2018. ^ "Listed Buildings in Bovey Tracey, Devon, England". britishlistedbuildings.co.uk. Retrieved 26 June 2013. ^ "Church of St Peter and St Paul and St Thomas of Canterbury, Bovey Tracey". britishlistedbuildings.co.uk. Retrieved 22 January 2014. ^ Mee, A. The King's England:Devon (Hodder and Stoughton, 1965), p.47. ^ "East Dartmoor Baptist Church, Bovey Tracey". britishlistedbuildings.co.uk. Retrieved 26 June 2013. ^ "About the Guild: Frequently asked Questions". Devon Guild of Craftsmen. Archived from the original on 13 March 2014. Retrieved 22 January 2014. ^ Minchington, Walter (1974). Devon at Work: Past and Present. Newton Abbot: David & Charles. p. 23. ISBN 0-7153-6389-1. ^ "Bovey Tracey Heritage Centre". Devon Museums. Retrieved 26 December 2011. ^ Dowling, Rod. "The Bovey Pottery Company Limited". Retrieved 22 January 2014. ^ a b "Welcome to the Bovey Tracey website". Bovey Tracey Town Council. Retrieved 26 December 2011. ^ "The Dartmoor Devil". Audax UK. Retrieved 3 July 2016. Wikimedia Commons has media related to Bovey Tracey.